Monster Munchies, exclusive to the Good Food channel , celebrates Britain’s best food by supersizing some classic dishes. Big cream teas in Devon, huge Battenberg cakes in Windsor and colossal Cornish pasties in Cornwall are just some of the gigantic cuisines that will be served up in this larger than life series. Businesses across the UK are being challenged right now to make awe-inspiring portions of their local delicacy. 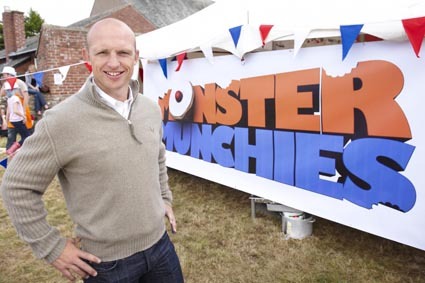 Former England rugby player and renowned foodie, Matt Dawson, presents this against-the-clock cook-off where two local food producers will make up two competing teams. 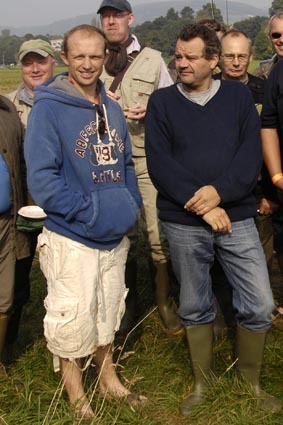 Matt and his crew are bringing the food fight to Abergavenny’s Castle meadows at 12.00 noon on Saturday 18 September. See the unveiling of – yes it had to be – a GIANT WELSH RAREBIT – and sample it too! The 24-hour countdown will begin as the mega meal is pieced together. Five local judges will choose the winning team based on taste, size and presentation. Monster Munchies celebrates the ingenuity, local spirit, and delicious taste of the area. As well as the accolade of making such a huge feast, the winning team will be presented with an oversized golden spoon trophy.